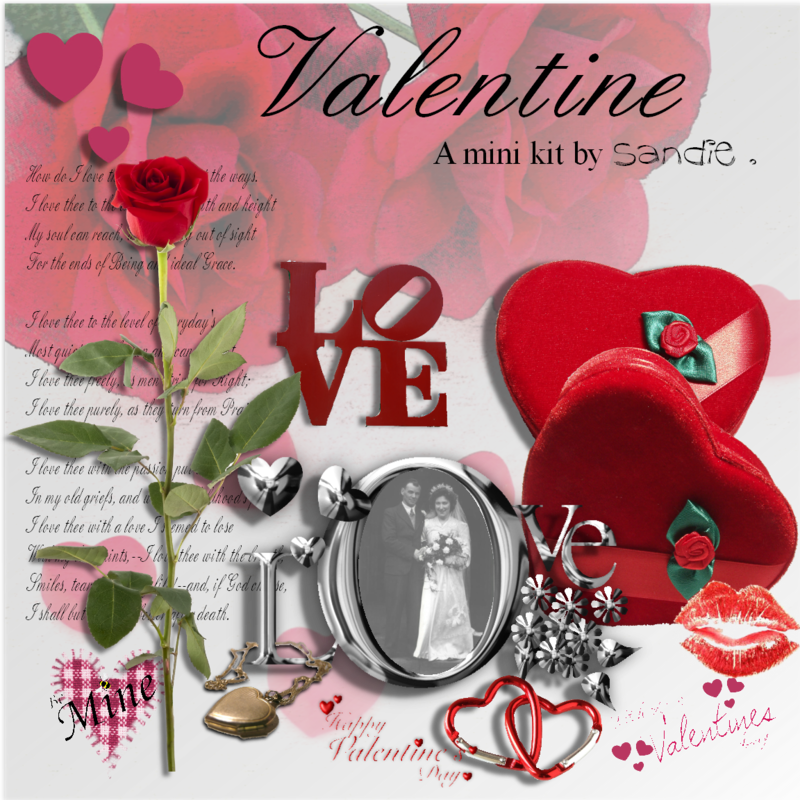 Valentine is my first mini kit made to share as a freebie . I picked Valentine as it was my dad’s middle name – he was born on Valentine’s day, so my first kit is for him. Below are the links for downloading. Have fun. Thank you so much for sharing your beautiful Valentine’s kit! on January 24, 2012 at 8:36 pm | Reply Lori M.
Such bright reds which I love! Perfect word art. Thank you so much for having fun and sharing it with the rest of us! Thank you so much for your lovely freebies, they are wonderful. Your work is fantastic and I really appreciate your generosity in sharing it with us all. I hope I can learn to be as skillful! I have just downloaded your Blossoms 1 kit – the very first time i’ve been able to successfully download a member freebie. I thank you so very much for this freebie pack – its so appreciated to people like me who are yet to begin to design a digi kit. This is something that I would love to be able to do and will hopefully do some one day. I am fairly new to CA and have just downloaded several of your beautiful kits…thank you so much for sharing with us Sandie…they look gorgeous and I know I shall enjoy plying with them. You are such a talented lady, Sandie. Thank you. Lovely Kits . Thank you so much. I especially like the family history one. Thank you so much for all your beautiful kits Sandie (yes, I got them all!). I’m a completely new digital scrapbooker, with a budget of about zero. 😀 I so appreciate the lovely kits and you willing to share them. Thank you for the beautiful digikits that you give so freely. Much appreciated. Just down loaded your lovely kits. Looking forward to using them. Thanks for sharing. Thank you so much for freebies they are fab. Have just downloaded ‘Family Tree, Generation & Memories as about to makr a scrapbook for mu mum’s 90th birthday!! Thank you Sandie. I have previously downloaded your Memories, and Recollections packs, but I cannot download any more of your Freebies as my antivirus removes them. Such a shame as the two kits I have are gorgeous and I have uploaded a page using memories to Daisy Trail. Thank you so much for sharing. Thank you Sandie for sharing your beautiful kits. I made a page with the Memories kit and uploaded it to Daisy Trail and it has been much admired. I love the subtle colours of this kit. Further to my comment of 8th March, I have now sorted out my download problems. Thank you. Sorry didnt pick up your comment sooner Thank you and you are welcome.